Having been the CEO since March 2004, Sanjiv is now the Chairman of Orange SA. He was the Chief Operating Officer of Orange from April 2003 to March 2004. During his leadership, Orange customer base has grown from 43 million to over 100 million customers worldwide, with the footprint expanding to include Poland, Spain, Senegal and Mali. The Orange Brand has also been adapted by France Telecom for its broadband and TV offerings. 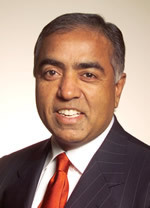 Sanjiv’s previous industry experience includes the role of President of Telcordia Technologies (formerly Bellcore), the world’s largest provider of operations support systems, network software and consulting and engineering services to the telecommunications industry. Prior to that, he spent fifteen years at IBM in various executive roles. His last responsibility included leading IBM’s entry into the telecommunications software industry. Most recently, he was CEO of Comstellar technologies, the Californian based technology company. He is currently a non executive director of Cadbury Schweppes and William Sonoma Inc. He has a degree in electrical engineering from Delhi University, India, and a masters degree in computer science from Columbia University in New York.